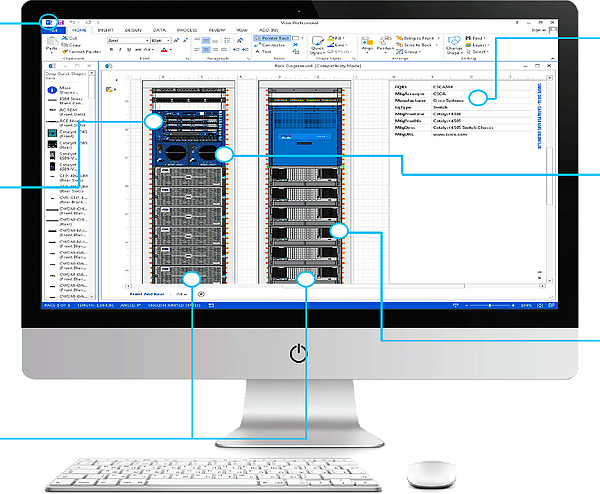 The NetZoom Visio Stencils library is the world’s largest device library of stencils and is constantly updated with new shapes to represent the latest hardware in the market. If there is a network equipment shape that is not in our library, we will create it for no additional charge. NetZoom Visio Stencils works with Visio 2007, 2010, 2013, 2016 and even language specific versions of Visio on Windows machines including Windows 8. Drag and drop cards and modules into empty slots to configure chassis and create accurate true to life replicas of your equipment. Stencils come with front, rear, 2D and 3D views. All stencils include manufacturer product info, dimensions, port data and much more. The high quality vector graphic stencils enable users to zoom in directly to data ports and power ports for creating connections and wiring diagrams. All stencils contain high quality scalable vector graphics that represent manufacturer specific equipment.